Free comic book day this year fell on May 3rd 2008, at a variety of comic stores across the country. This was my first time in attendance. I must say, the whole day just blew me away. I first heard about free comics day about two weeks ago, However, I don’t think anything could have prepared me for the amount of people that would be turn out. A variety of people come to this event, I saw everyone from a young child with his/her dad to seasoned veterans of the comic book trade. Jon, Christy and I started our day at Collectors Edge south, where there the overall atmosphere was laid back yet a bit overwhelming in the amount of graphic novels available. Steve the owner always happy to see customers in his store, and always willing to lend a helping in hand in the search of the perfect comic book. After looking at the free comic selection we wanted to take some time and think about the ones we would like to own, well deep in thought we purchased a few comics that were top on our list to read. 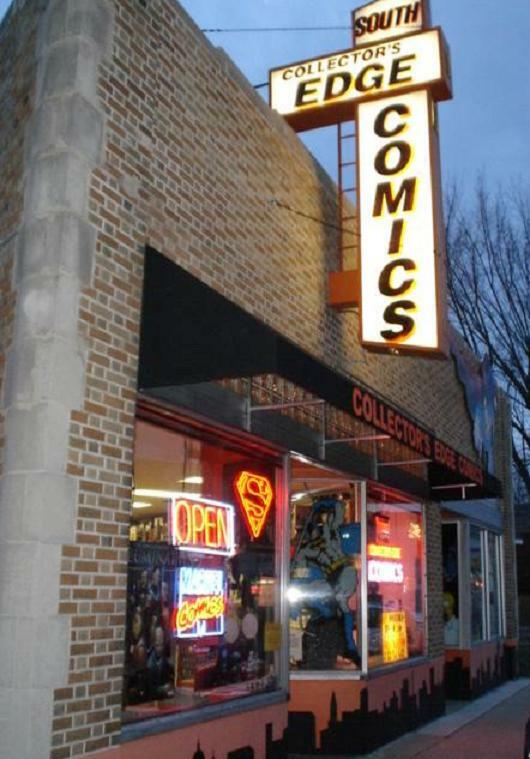 Next on our adventure of the comic world was Collectors Edge west, don’t let the small size of this store fool you. The knowledge and expertise possessed by the managers and workers is endless. Not only that, but the manager of this store has taken such interest in his work he now has his very own published comic book. Our last stop in the world wind tour was The Lost World of Wonders Comic shop, the size of this store alone is most impressive. Not to be outdone by their competitors they also gave additional discounts on select merchandise. The employees at this store also had a vast knowledge of their merchandise and were very polite. If I have held your attention this long, please continue reading and find out which comics I picked and my short review of each. For someone who has taken an interest in comic book art, I thought this comic was very informative and an excellent reference. This comic gives brief overview of character and scene creation. This comic gives the reader a nice background of the golden army, and works well to lead up to the release of the Hellboy two movie coming out this summer. Superman has been around for years and the reason for this, everybody needs a hero. This issue is the first in a series, where Clark lets Lois in on a secret, but he’s dying! Find out why? Introduction gives very nice background of Bruce Banner, the artwork is stunning however no dialog and this comic just gives overview of upcoming issues. Now onto the Iron Man portion, very similar to The Hulk, same stunning artwork, again no dialog, however nice background on Tony Stark. Wonderful graphics and a solid story line with a good explanation of villain’s superpowers, complete with diagram. Well balanced interaction between all three characters, also good for all age readers. Well written and sensational artwork, defiantly young adult to teen readers would enjoy the crude humor and mild profanity this comic offers. Definitely one comic that this reviewer will keep an eye on. Written in classic X men style, wonderful interplay between characters. Main hero of this issue is a newer character named Pixie Dust. This is a enjoyable all ages comic. Alex Ross…do I need to say anymore? Well written and laid out, outstanding artwork, follow The Supers in their struggle to save the world against the claw. All ages welcome. This is one to check further into, great graphics and solid story lines will defiantly hold a readers interest. Also included in this are three other short advances of comics in the Top Cow line including, Witch Blade and The Darkness. A great overview to a story I will be following. The world is about to be destroyed and aliens have drafted the human race against the world eaters. Will they win? Overall I believe free comics day is a great introduction into the world of comic/graphic novels and can be enjoyable for new readers to veteran readers alike. I have now started a wonderful collection of comic/graphic novels and I look forward to reviewing more of these wonderful works of art and literature. Spending the day hitting multiple stores with Timm and his wife Christy was great fun. My own wife has seen this phenomenon often enough with comics, novels and DVDs and music that she opted to stay home and wait to see what I picked up. Top Cow used their free comic to bring readers into their next big event which will include multiple characters including Witchblade and Darkness. Nice story from Ron Marz with a nice job on art by Stjepan Sejic. I’ve been enjoying Top Cow comics this past few years and if this book is an indication of this summer’s reading it looks to be good. I’m with Timm. Alex Ross, how can you go wrong? Aside from the great cover, this is a nice jumping on point to the series that Ross and Jim Krueger are doing with the interior art handled by Andy Smith. A super team from WWII is resurrected and they are trying to find their place intoday’s world and stop evil. This is a nice short intro to the comic followed by some preview stuff of the other Dynamite titles. This is a collection of previews of upcoming comics, all based on books by novelists including Jim Butcher’s Dresden and Dean Koontz’s Frankenstein. Also a look at the latest of George RR Martin’s Wild Cards. This is enough to make me want to pick up the Dresden comic, maybe the two by Koontz. I’ve read some WildCards back when it was with Marvel’s Epic line, I may look at it when it’s collected. Timm is right again. This is a great prelude to the HellBoy movie coming this summer. An explanation of what the Golden army is as told in a childhood story to a very young HellBoy. I already love HellBoy, but this really gets me excited about the movie. A collection of shorts, The Mole, Bishop Olek’s Devil and Out of Reach. I nice trio which puts a nice wrap around the HellBoy universe with a HellBoy stand alone, a B.P.R.D. story and a tale of Dr, Eaton as a young man. Original stuff and a nice bonus for fans or new readers. A series of short Stories collected and illustrated, pretty representative of what they do over at Graphic Classics. May be a bit to literature based for some, but a nice sampler. I really liked the Edgar Allan Poe story. That aside, Mike Carey wrote a very engaging intro to this series here and I’m intrigued. People with false memories, aliens and based on a Sci Fi channel show. The flip side is a classic UK hero done by Garth Ennis, with no swearing or nasty violence, worth looking at just for the novelty of it! It does look like something I may read more of. Kind of Hellboy with a robot. Nice art, interesting tale. I may look for more. Always a bit different from the norm Oni Press really lets the creators shine. This series involves a couple regular joes working at a laboratory doing, yes, Maintenance. Time Travel, weird doctors and cavemen. Hmmmmm….. I may read more of this Jim Massey Robbi Rodriguez title. Also a look at a mini series called Resurrection, post Apocalypse last humans alive after an alien invasion… the preview is interesting, I may seek out more, though it feels a bit like Walking Dead by Kirkman. Overall a nice haul I found some new titles to look into actually buying. I also bought some trades I found on sale, Jon Sable Freelance Volume 2 by Mike Grell from IDW, the first four Daredevil trades written by Ed Brubaker. Ed Brubaker is a genius and having this much talent should be illegal. I bought a trade of HellBoy Jr. Rude nasty fun. I also got some trades for Timm that I felt he really needs to own, so maybe we can talk him into reviewing these classics later right here.